OmronYou are currently viewing the H7BX page. H7BX with the backlit LCD gives a excellent display view. The main display PV has a height of 13.5mm and SV has a height of 9.5mm. It can be green or red and it can be programmed to change if a specific value is reached. 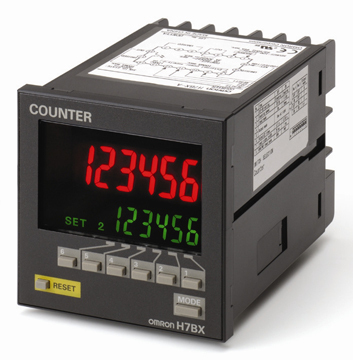 All basic counters functions are covered with many different output modes. Easy setup by dip-switches for the basic functions.